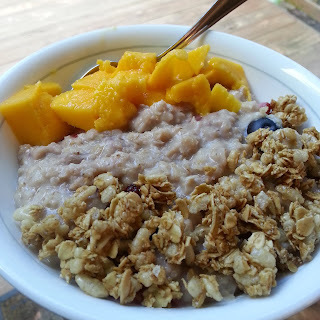 Since going vegan, my love for oatmeal has exploded. I didn't realize there were so many different combinations you can create! Before going vegan I used to eat quick oats cooked in the microwave with water, served with white sugar, dairy butter, and dairy milk. I nearly always ate it with a slice of toast. Who knew you could add frozen fruit, dried fruit, fresh fruit, nuts, granola, seeds, and so much more?! With all the endless combinations you can create there's no reason why anyone should ever get tired of oatmeal. 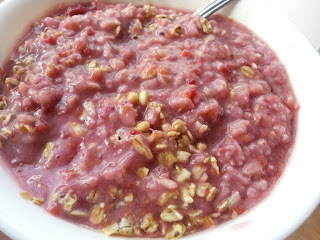 Magenta colored oatmeal, anyone? This oatmeal was cooked with frozen raspberries, chia seeds, water, and some almond milk on the stove. I finished it off with some granola and a little maple syrup. Can't quite remember what all is in this bowl of oatmeal, but I'm sure there was some ripe banana cooked in with the oats. If you take ripe, spotty bananas and add them to your oatmeal while you cook - whether it be in the microwave or stove - it will add a very nice natural sweetness. I highly recommend trying it! This was my most recent creation and boy, was it good! I cooked some oats on the stove with water, milk, fresh mango, and a little maple syrup. 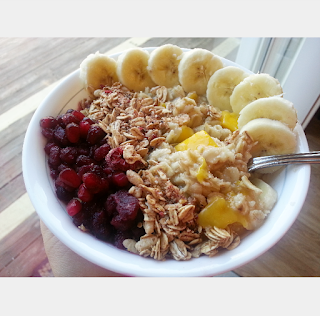 I topped it off with some ripe banana, frozen pomegranate seeds, and the last little bit of granola from the pantry. 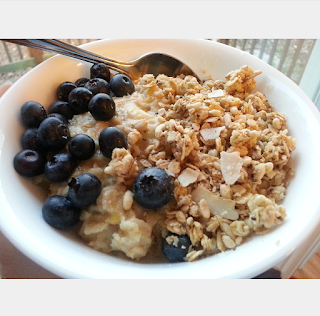 I think this bowl of oatmeal pictured above had some blueberries and maybe some strawberries cooked with it. Then I topped it with some fresh mango and granola. This the least healthy one of all but it's so good. I call it Apple Pie Oatmeal. 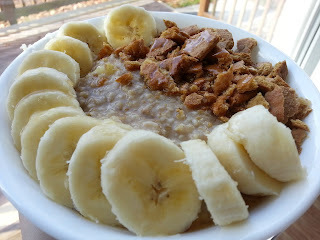 To make it I simply cook some chopped apple in the oatmeal with some cinnamon, and usually some maple syrup. Then I top with crushed graham crackers (Nabisco Original Grahams, they come in a red box). This bowl happened to have some ripe banana too. I have not used butter or "sugar sugar" in my oatmeal since going vegan. Something I always add to my oatmeal is pure maple syrup. It's more natural, less processed, and adds a perfect sweetness! I also always like to cook either some frozen fruit, or fresh fruit in the oatmeal while it's cooking, and I like to use a combination of water and almond milk to cook the oatmeal with. I do like a little crunch with my oatmeal so I'll usually add some granola or cereal on top. But you could add nuts if you prefer. I only use old-fashioned 100% rolled oats. However, steel cut oats are good too if you prefer those. There are so many things you can add to oatmeal. The combinations you can create are endless, so have some fun!